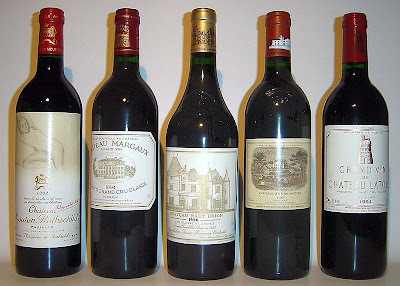 I just thought this was a great picture of the big five and so I wanted to share it with those of you who share my passion for great Bordeaux. Sure there are some truly amazing wines from Bordeaux that I fancy just as much as these five....ie (Angelus, Palmer, Pavie, ect..), but there is no doubt something special about the first growths. I have had my limited experience with these wines but the ones I have been lucky enough to enjoy were memories that I'll never forget. I thank the generous wine buddies I have for these amazing experiences and hope to one day be able to pass them on to the next generation of wine enthusiasts. Because that's really what wine is all about isn't it........Sharing the experience of life.